We’d love your help. Let us know what’s wrong with this preview of Rust on the Razor by Mark Richard Zubro. To ask other readers questions about Rust on the Razor, please sign up. Tom and Scott head to Scott's hometown to see his sick father. The South is not welcoming to their relationship. While there someone is killed and Tom is suspected. Tom works to clear his name all the while fighting bigots, a lunatic, and hatred from some of Scott's family. This author captures the bigotry and Southern mannerisms to a tee. I like this story can't wait to read the next story in the series. 3.5 stars. 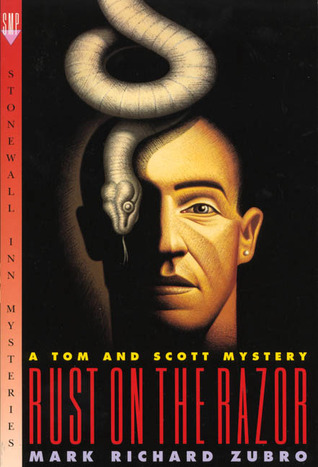 Good gay mystery in which Tom and Scott go to rural Georgia after Scott's dad has a heart attack. They are not at all prepared for the bigotry and hatred they encounter. I picked this book up because a friend said it was good and ya gotta love a book by a white man that takes its title from a Maya Angelou quote. But it's really not good. The word choice is forced and all of the characters are two dimensional, including the two main ones. In the introduction the author thanks all of the people he spoke to about life in the South, but none of it feels real. Disliked intensely. Stereotypes of racist, homophobic, Neanderthal southerners don't set well with me. I may be a Yankee, but my Mama is from the South, and I found much of this offensive (although I found their attitude toward Tom and Scott offensive also). I always new I didn't want to visit rural Georgia. This was an entertaining book, and as with all of his books, I certainly didn't know who committed the crime until the end. An exciting story. A view of Scott's family we didn't see before. Author also writes as: Mark Zubro. Mark Richard Zubro is an American mystery novelist. He lives in Mokena, Illinois and taught 8th grade English at Summit Hill Jr. High in nearby Frankfort Square, Illinois. Zubro writes bestselling mysteries set in Chicago and the surrounding Cook County area, which are widely praised as fast-paced, with interesting plots and well-rounded, likeable characters. His n Author also writes as: Mark Zubro. Zubro writes bestselling mysteries set in Chicago and the surrounding Cook County area, which are widely praised as fast-paced, with interesting plots and well-rounded, likeable characters. His novels feature gay themes, and Zubro is himself gay. His longest running series features high school teacher Tom Mason, and Tom's boyfriend, professional baseball player Scott Carpenter. The other series Zubro is known for is the Paul Turner mysteries, which are about a Chicago police detective. The books are a part of the Stonewall Inn Mystery series, published by St. Martin's Press. Zubro won a Lambda Literary Award for Best Gay Men's Mystery for his book A Simple Suburban Murder. I am the author of twenty-four mystery novels and five short stories. My book A Simple Suburban Murder won the Lambda Literary Award for Best Gay Men's mystery. I also wrote a thriller, Foolproof, with two other mystery writers, Jeanne Dams and Barb D'Amato. I taught eighth graders English and reading for thirty-four years and was president of the teachers' union in my district from 1985 until 2006. I retired from teaching in 2006 and now spend my time reading, writing, napping, and eating chocolate. My newest book, Another Dead Republican, is my thirteenth book in the Tom and Scott series which features as main characters, a gay school teacher and his lover, a professional baseball player. One of the keys in my mysteries is you do not want to be a person who is racist, sexist, homophobic, or a school administrator. If you are any of those, it is likely you are the corpse, or, at the least, it can be fairly well guaranteed that bad things will happen to you by the end. And if in my books you happen to be a Republican and/or against workers' rights, it would be far better if you did not make a habit of broadcasting this. If you did, you're quite likely to be a suspect, or worse.